Miss the event? Catch Jim’s TEDx talk on YouTube! 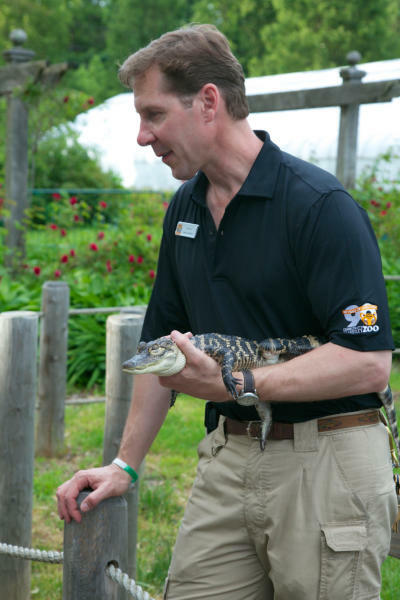 Connecticut’s Beardsley Zoo’s Curator of Education Jim Knox will participate in a TEDx talk on Thursday, October 5th at 5:00 pm. in the Danbury High School Theater. Education Curator and Wildlife Ethologist Knox will talk about “How a Shark Taught Him to See,” detailing his fieldwork studying Great White Sharks, Grizzly Bears and African Lions, and how understanding the context of animal behavior can relate to everyday life. The event is free of charge, but overwhelming interest has required ticketing. For tickets, email tjaltieri1@gmail.com. Space is limited, and restricted to the first 100 requests, per TEDx rules. Guests should present their ticket confirmation number and ID outside the theater the night of the event for admission. In the spirit of ideas worth spreading, TED has created a program called TEDx. TEDx is a program of local, self-organized events that bring people together to share a TED-like experience. The TED Conference provides general guidance for the TEDx program, but individual TEDx events are self-organized. With more than 3,000 presentations to his credit, wildlife expert Jim Knox revels in sharing his passion for working with the world’s most remarkable animals to transport audiences into his wild world. Early on, Jim realized he commanded a unique opportunity—to partner with others to save the world’s wildlife through the power of the spoken word. This realization leads him to deliver exceptional and enlightening presentations that raise awareness about conservation initiatives for the world’s most critically endangered wildlife. Jim currently serves as Curator of Education at Connecticut’s Beardsley Zoo, where he has worked for nearly 20 years.